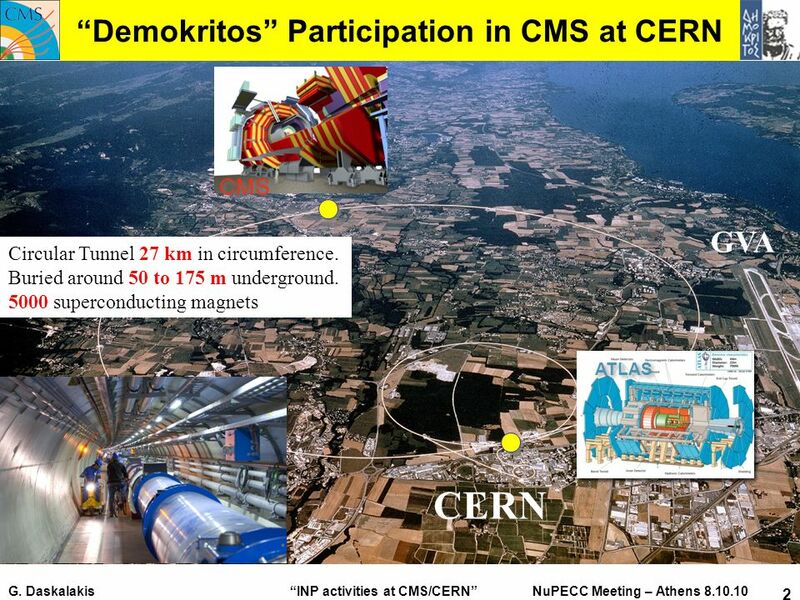 G. Daskalakis INP activities at CMS/CERN NuPECC Meeting – Athens 8.10.10 1 Demokritos Participation in CMS at CERN INP Activities at CMS/CERN experiment. 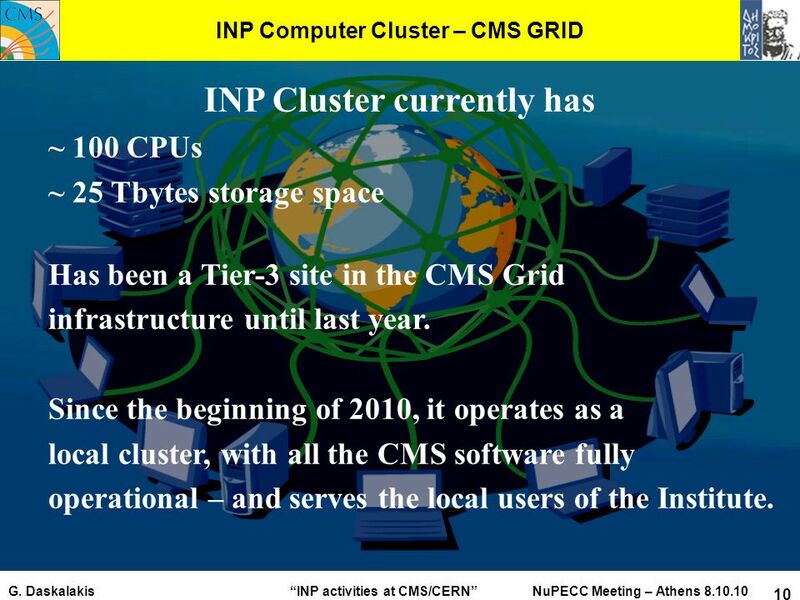 10 G. Daskalakis INP activities at CMS/CERN NuPECC Meeting – Athens 8.10.10 10 INP Computer Cluster – CMS GRID INP Cluster currently has ~ 100 CPUs ~ 25 Tbytes storage space Has been a Tier-3 site in the CMS Grid infrastructure until last year. 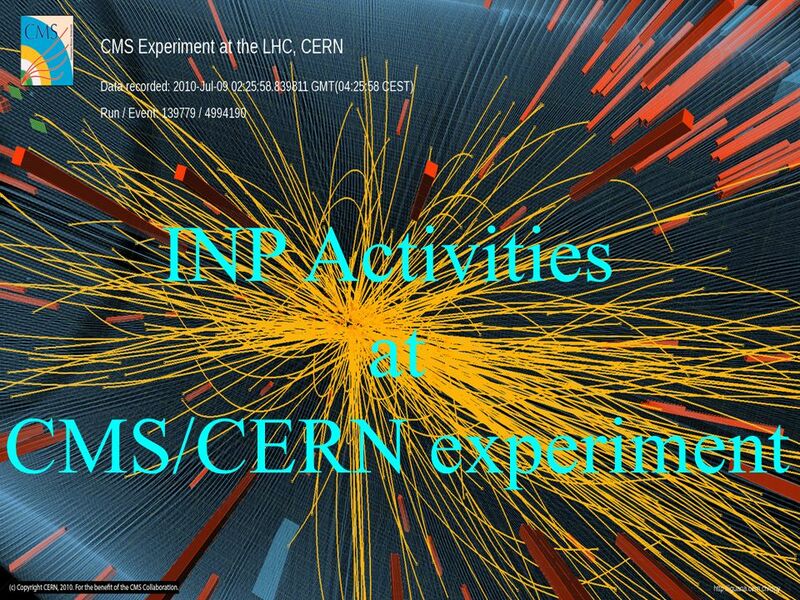 Since the beginning of 2010, it operates as a local cluster, with all the CMS software fully operational – and serves the local users of the Institute. 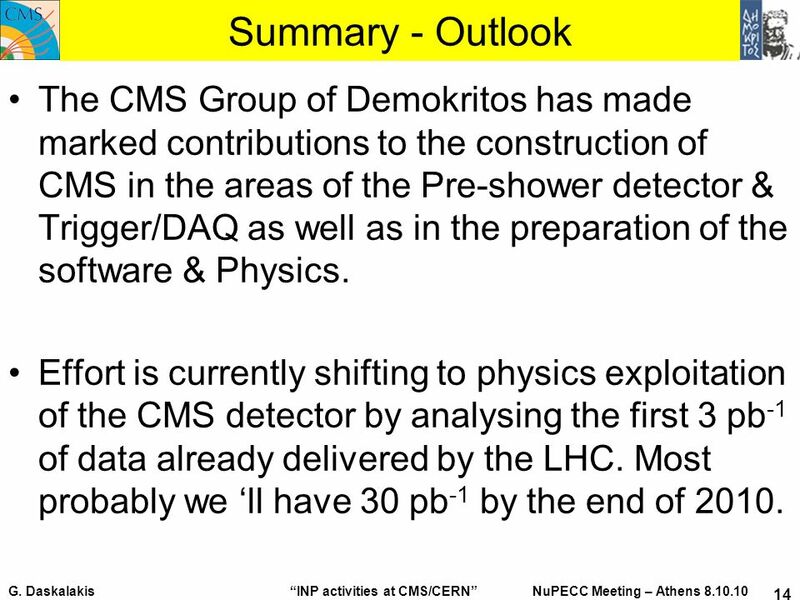 14 G. Daskalakis INP activities at CMS/CERN NuPECC Meeting – Athens 8.10.10 14 Summary - Outlook The CMS Group of Demokritos has made marked contributions to the construction of CMS in the areas of the Pre-shower detector & Trigger/DAQ as well as in the preparation of the software & Physics. 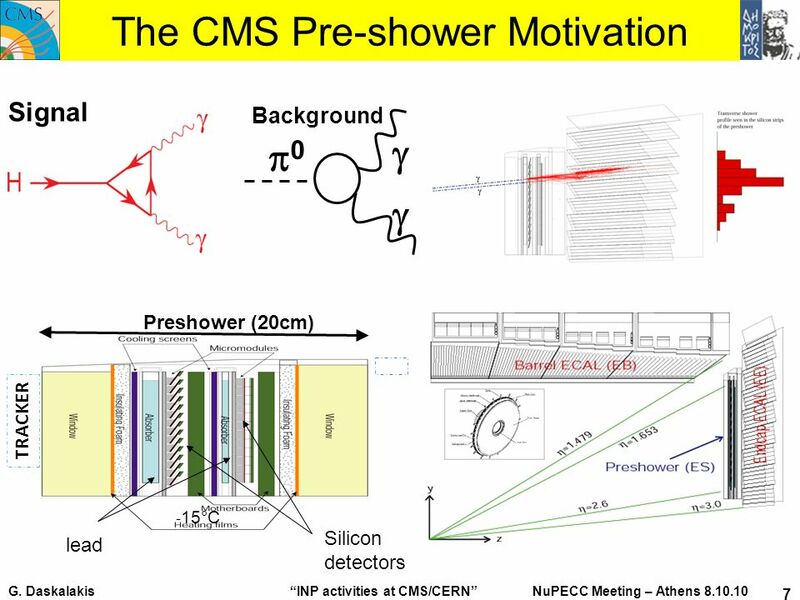 Effort is currently shifting to physics exploitation of the CMS detector by analysing the first 3 pb -1 of data already delivered by the LHC. 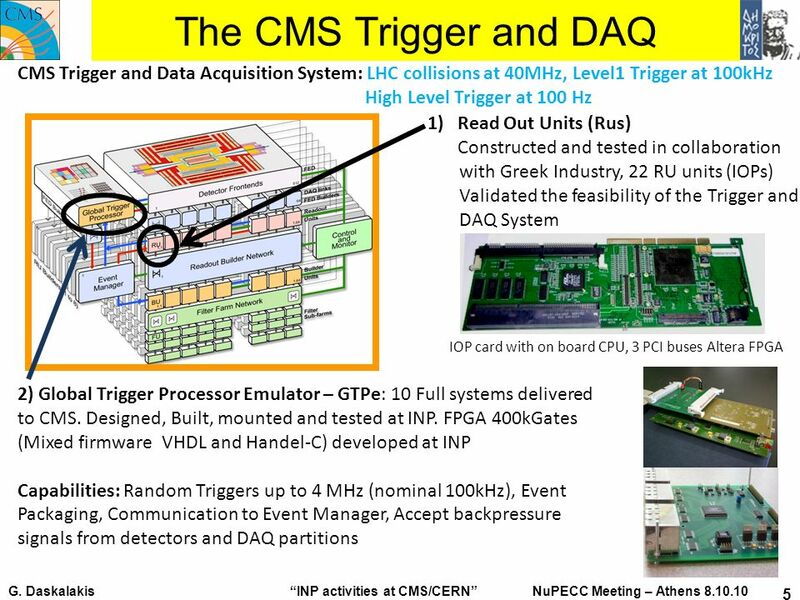 Most probably we ll have 30 pb -1 by the end of 2010. 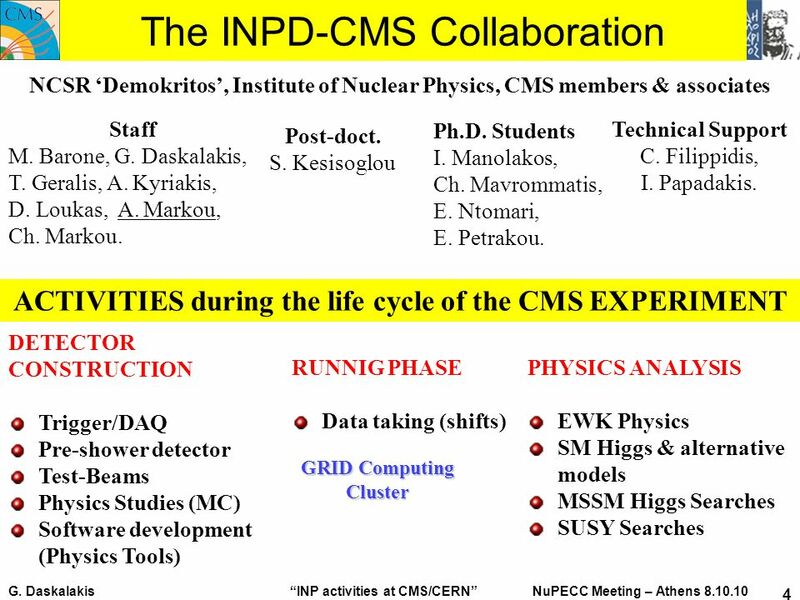 Download ppt "G. Daskalakis INP activities at CMS/CERN NuPECC Meeting – Athens 8.10.10 1 Demokritos Participation in CMS at CERN INP Activities at CMS/CERN experiment." 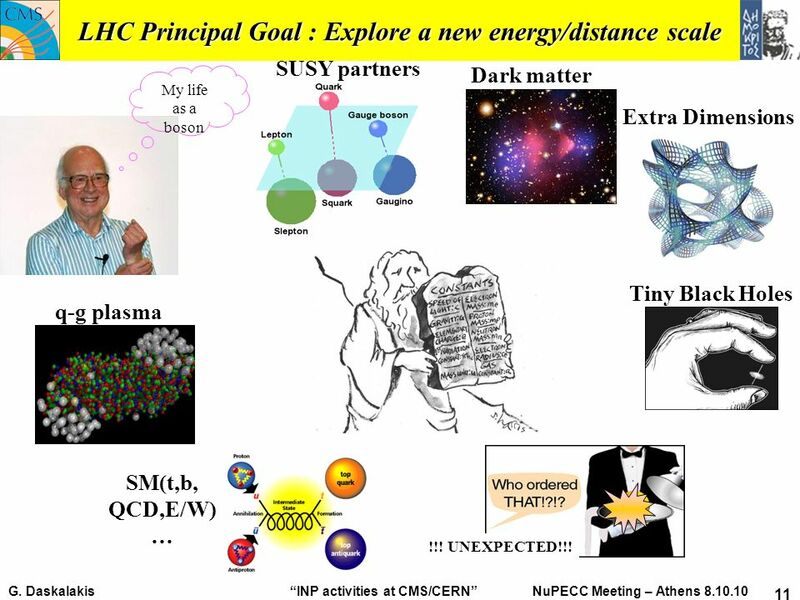 TYPE TEXT HERE On July 4, 2012, scientists at CERN announced the discovery of an essential part of the Standard Model of particle physics: the Higgs. 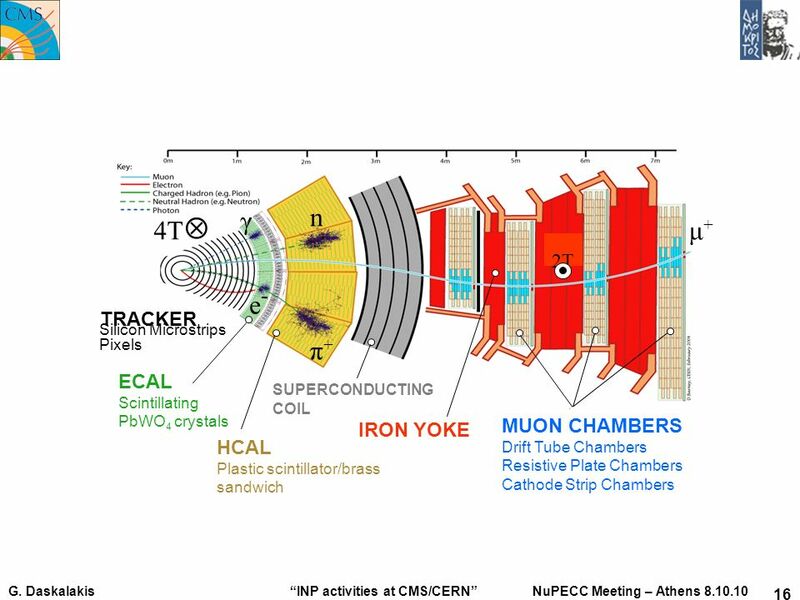 LHCb Alignment 12 th April 2007 S. Viret Coseners Forum « LHC Startup » 1. Introduction 2. The alignment challenge 3. Conclusions. CMS-UK Oversight Committee 18/11/03 D.J.A. 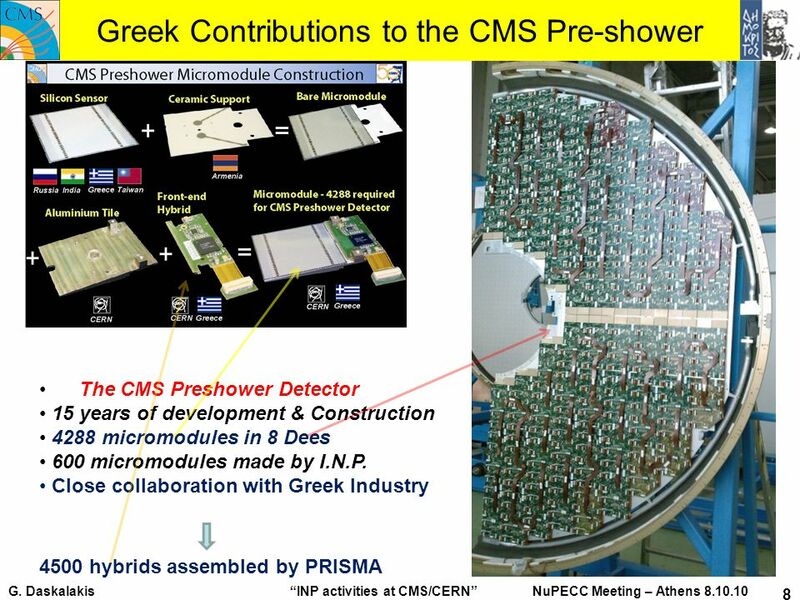 Cockerill - RAL 1 The CMS ECAL Endcaps Crystal ECAL Endcap Calorimeter (EE) Preshower EE. 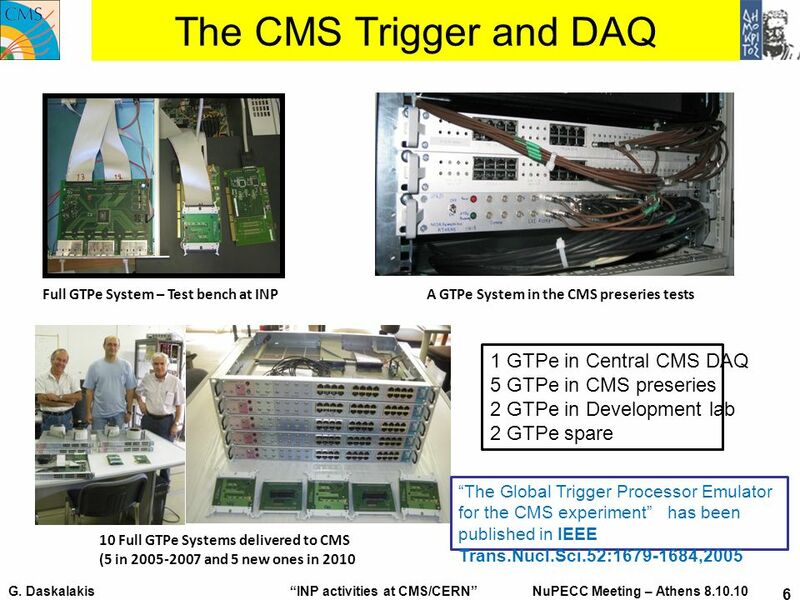 ATLAS-CMS SLHC Workshop, 20/3/07 Costas Foudas, Imperial College London 1 Results from Studies for a Tracking Trigger for CMS at SLHC Overview of this. 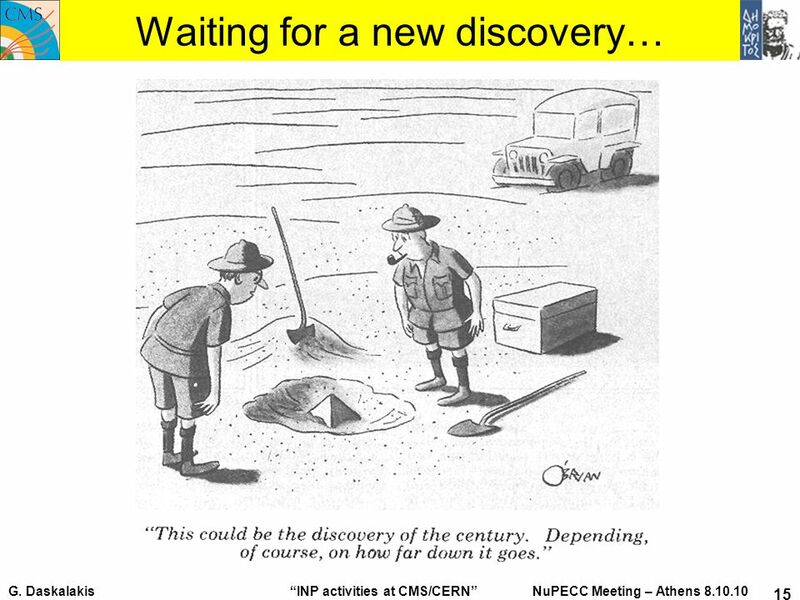 Higgs Bosons through Experiments Zeinab Shafiee IMPRS Retreat - Hamburg. 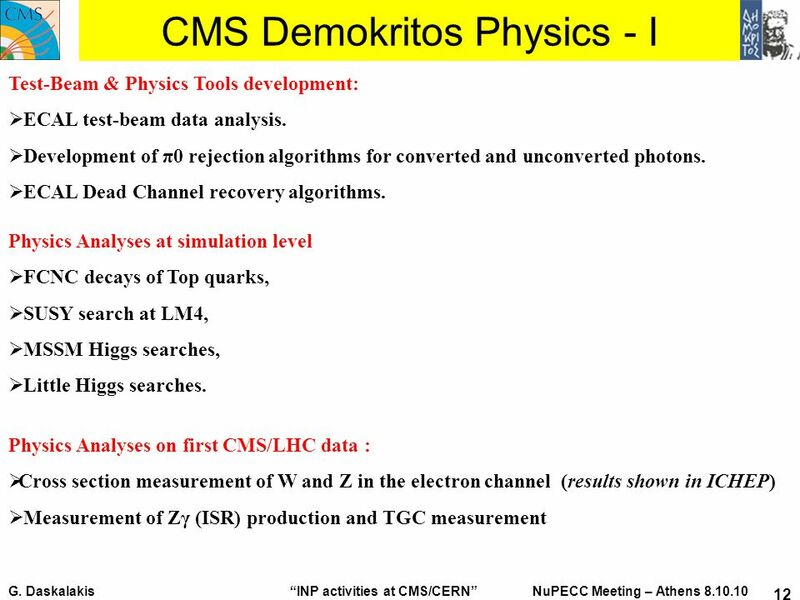 CMS Software and Physic project at HIP V. Karimäki Project evaluation meeting CERN, May 22, 2006. 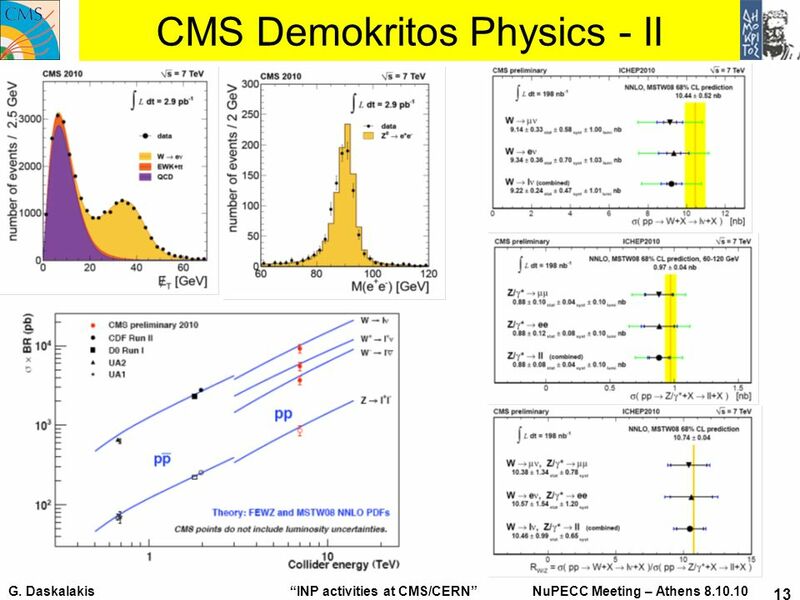 Quark Matter 2011, Annecy, May Ridge correlation structure in high multiplicity pp collisions with CMS Dragos Velicanu for the CMS Collaboration. 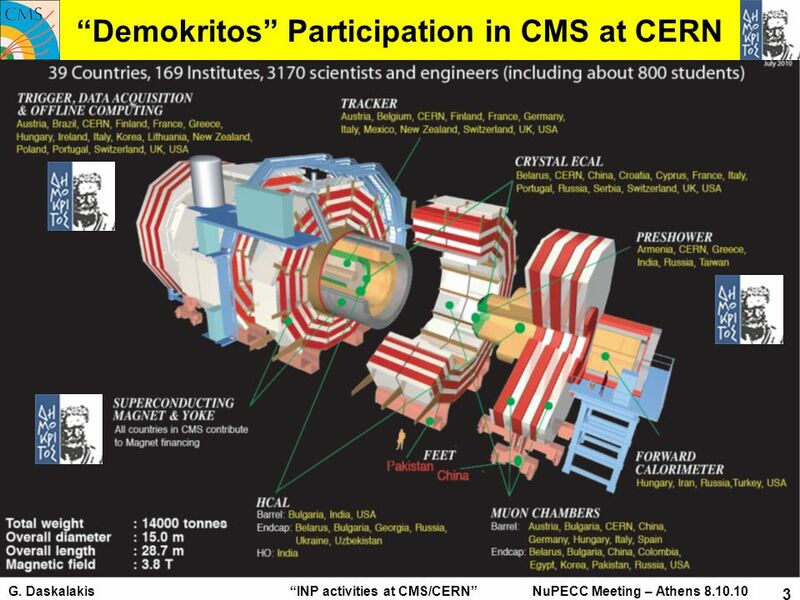 CMS 1.Goal of the experiment CMS is a general purpose apparatus for LHC designed to study the physics of p-p collisions at the center-of- mass energy of.